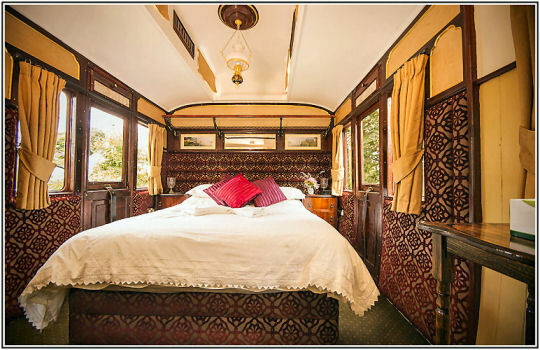 Our holiday carriage Mevy has been finished to the highest standard and has several features unique to the coach, including a sumptuous first class bedroom compartment, a proper bath with ball and claw feet and a traditional cooker in the kitchen. 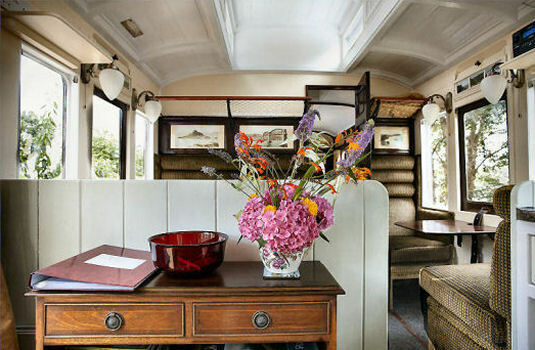 Unlike the Old Luggage Van and the Travelling Post Office, Mevy doesn't have a wood burner, but is very warm in winter as it is centrally heated by our wood fuelled biomass boiler. We do the work so you don't have to! Mevy is suitable for allergy sufferers as it is pet free and has hypoallergenic bedding. Please let us know if you would rather we didn't put in fresh flowers! 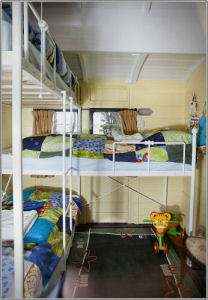 Mevy will sleep up to five, so is good as both a romantic retreat for couples, or for families with young children. 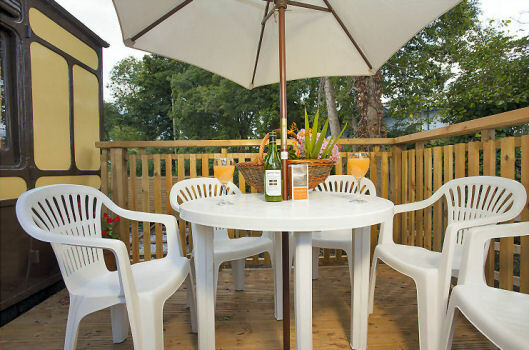 Outside there is a private deck, perfect for long summer’s evenings. There is private car parking and access to the children’s play area and games room. The view from the carriage is stunning - over the river Lynher to rolling fields - and with binoculars you can see trains coming through the cutting on the other side of the valley. Guests in Mevy have access to our ten acres of private woodland, with winter snowdrop walk, nature trail, bluebell, garlic and summer flowers and sweet chestnuts in autumn. 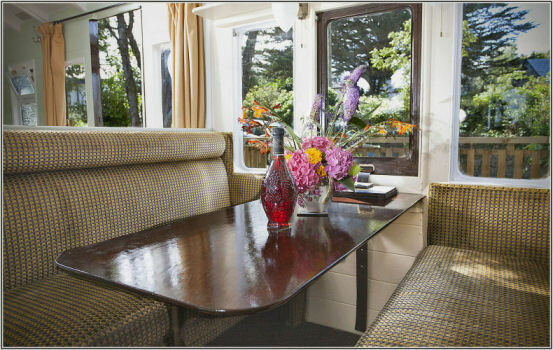 St Germans is in the Tamar Valley Area of Outstanding Natural Beauty. Its location on the river Lynher with its Site of Special Scientific Interest status makes St Germans the perfect base for your bird watching, cycling or walking holiday. 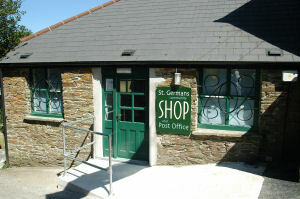 Furthermore, the railway station and Railholiday are within the beautiful St Germans Conservation Area. The coast with its beaches, fishing villages, magnificent cliffs and coastal footpath is only a short bus or train ride away. 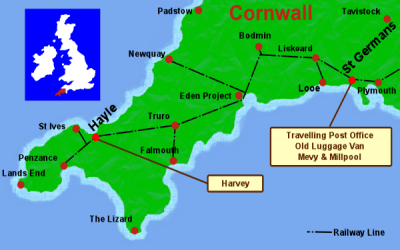 For more about St Germans and South East Cornwall, please visit our St Germans page. Mevy has a unique character. Slip coaches were put at the back of fast trains and uncoupled on the move by the guard, who then brought the carriage to a halt in the station. Because they had to cater for all classes in one coach Mevy has first, second and two third class compartments, as well as a guard's room. 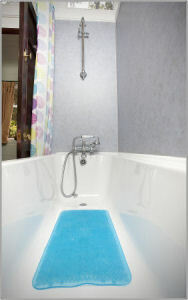 Ample central heating included in holiday price. 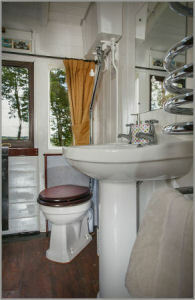 Click here to book your holiday in Mevy on-line now or check availability and prices. St Germans is a small village with a population of 600. 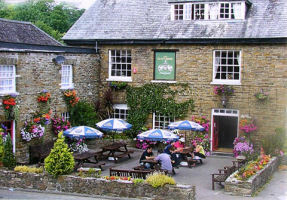 Only a ten minute reasonably level walk from the carriage is a great village pub, The Eliot Arms, (01503 232733) serving Cornish ales and food. The railway station at St Germans was built in 1858 to a design by Brunel. Although the main railway station building is now lived in by your hosts, the platform is still in use - served by 12 stopping trains per day each way including 3 direct London trains.